Nestled into a hillside and surrounded by ancient oak and olive trees in the heart of Sonoma wine country, Olea Hotel is a small boutique hotel set on a historic property with unique amenities. Olea’s signature offering is its breakfast (included in the price.) With a distinctive menu designed by Executive Chef Khambay Porterkhamsy, which changes daily and seasonally, Olea Hotel's complimentary breakfast includes a two-course plated breakfast mixing sweet and savory items, along with a delightful breakfast buffet. The new menu includes items such as a warm beignet with cardamom sugar and peach compote, fraiche waffles with cultured butter, warm apples and maple syrup, and poached egg on bacon, corn, pepper, zucchini ragout with avocado garlic aioli and smoked tomato vinaigrette. Olea Hotel also features modern guest rooms with amenities such as: heated bathroom floors, Comphy Company sheets & plush duvets, 40” flat screen TVs with DirecTV and HBO access, DVD players, free Wifi (business class WiFi access throughout the property), robes, complimentary in-room snacks and water, Oxygenics shower heads, outdoor seating, and some have fireplaces. Olea Hotel also has unlimited complimentary wine and refreshments, massage services, weekly wine tastings with a guest winery paired with homemade appetizers, an outdoor hot tub in a beautiful garden setting, electric vehicle charger, free DVD rentals, lobby computer access, daily newspaper, game rentals, and free parking. Olea Hotel is walking distance to downtown Glen Ellen, including various wonderful restaurants, bars, and tasting rooms. It is the perfect location for a romantic wine country getaway! 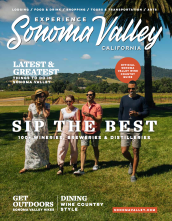 Sunset Magazine's 2016 Winner for "Best Wine Country Hotel/Resort"